Cascading Style Sheet has been around nearly since the dawn of time, but with the modern platforms and development techniques it has slowly replaced the old way of doing things. When I say old way I mean using tables to control content layout, or the entire website for that matter. For most end users, this matters not at all. It is only for those users who want more control over content layout that the depreciation of certain older HTML attributes in favor of styles can pose a problem. What this means in plan English, is that if you want to have real control over layout in ways not offered by even enhanced WYSIWYG editors, you need to learn a bit of CSS. I am an old dog who is not always interested in new tricks so my approach to CSS control is a just in time learning. That is, when I want to hack some CSS to say, make a plug-in look better in a site, I look up what I want to do. The one thing the web excels at is just in time learning for tech issues. All you need to know is how to use the language to target what you want to learn. Since I knew I needed the css I checked the page and found the CSS equivalent syntax. So, when it comes to CSS hacks I depend on just in time learning using sites like http://www.w3schools.com/ and so can you. With every new update of WordPress there is some new feature with the Media library and the recent one solved an old issue I had in the way it handled PDF. Inserting a PDF was handled poorly until recently. By poorly I mean that unlike an images, where the image shows up, a pdf by definition is a file that will need to be opened outside of the web site. In the old way (which you may still have to use if you have not updated your version) when you insert and pdf into a post or page, you get a link, but that link took you to another page where there is a not too obvious link to the PDF. Now when you select a PDF from the media library and insert it into a page or post it will put in a link and that link will open a PDF directly. Nice, but you still need to cross the T and dot the I. Most important, when you upload your PDF you need to give it a name, not just let the default file title be the name. You need to give it a Description and Caption too. This is best practice but it will become even more important latter. Upload your file via the media library add new button. Add your new title, caption and description. Now when you insert that pdf the title will be the link. However, I don’t like opening a pdf file in same tab as the link. I think it is nicer to open in a new tab. Highlight the link and then click the Chain Icon in the editor bar at the top to open the link edit window. Check the box for open in a new Tab/window. Click add link and save your file. Then view the file and check the link. 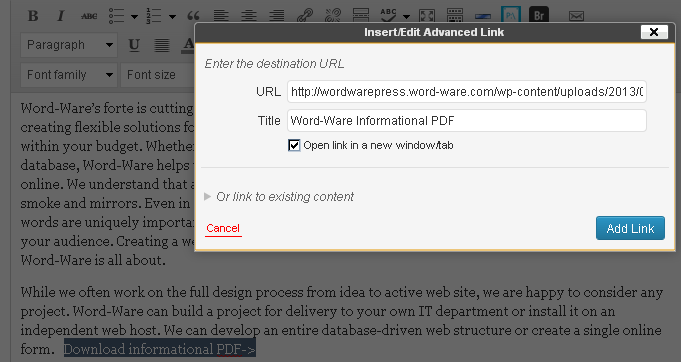 The link now opens the pdf in a new tab or window.